The Kurathene Empire, once the largest nation on Avlis, stretched across the vast northwestern plains and into the western reaches of the Deglosian Mountains, occupying roughly a quarter of the continent. The nation can greatly be divided into six regions based on borders and geographic features, most notably split via the Nomad River and climate: The Sorraine Expanse, Trenaine Peninsula, Medec Basin, Cytherian Frontier, Epillus Steppe and the Braccien Champaign. Although formerly the most powerful, prosperous nation on Avlis, the modern Empire is little more than a shadow of its former glory, a collection of squabbling nation-states formerly owing allegiance to the Imperial Crown. While various efforts to reunite the Empire have been attempted over the last two centuries the lack of a clear charismatic figure comparable to Joral Kuras and questionable claims to the crown have marked the failure of each attempt. The major powers in Kurathene today are the Fourth Imperium, the Crullathian Empire and the Pylatean League. The largest territories which retain their independence remain the Barony of Medec, the Kingdom of Cytheria and the Republic of Soreign, though the influence of these territories has waned in the presence of the great powers. The city of Kuras remains independent of any of the great powers, while twenty-six independent principalities and city-states remain unaligned throughout the region. The original inhabitants of the Kurathene Empire were mostly Romini and Dracon, who united together during the Fairy War, giving their leader the title of Kurath. The city of Centerpoint was established as capital, and after the Kurathene Republic was founded, the Great War started. During the Great War, the Kurath leader was a man called Joral Kuras. When the Great War ended, Joral Kuras united the Empire under his rule, thus establishing the Kurathene Empire, with Joral Kuras as immortal ruler. Through a series of events related to the artifact called the Godslayer, Joral Kuras was killed, creating the current state of anarchy in the former Empire. The inhabitants of Kurathene are predominantly human, concentrated primarily along the banks of the Nomad River, the shores of Amelede Bay and around Lake Mantith, an artificial lake dug in the middle of the Medec Basin. Large populations of wemics and dracon also exist, but they are more geographically limited, wemics to the Braccien Champaign, dracon primarily in the Sorraine Expanse. In the cities of Kalion, Medec and Brescant there are a sizeable number of elves primarily immigrated from the Seven Cities as well as a relatively large orcish population near Crullath. Dwarves and gnomes are also known to inhabit border regions though the numbers that actually consider themselves Kurathene are small. Shaahesk are rarely if ever seen in Kurathene due to long-standing racial animosity between noble families and their Drotid counterparts. Despite the fall of Joral Kuras, the predominant faith in Kurathene is still the Church of Toran, who have a strong contingent of worshippers both human and dracon. Religious diversity tends to expand as one moves away from the city of Kuras, with the southern ends of the Champaign particularly fruitful in diversity, ranging from Mikon to Hurine. 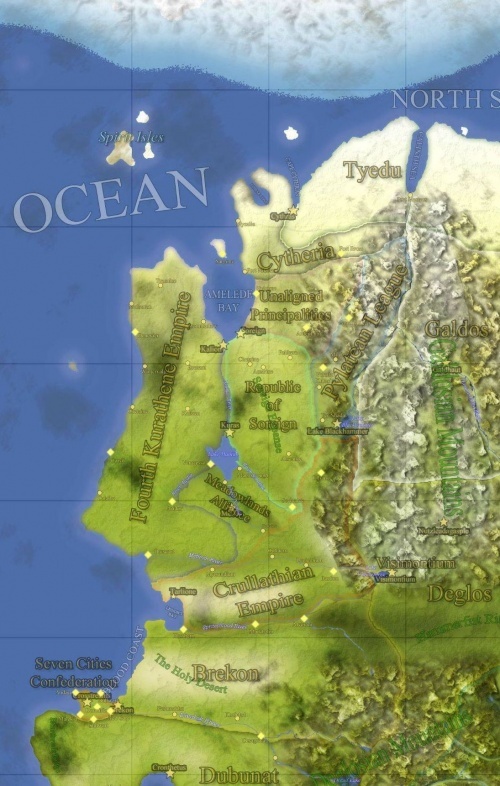 Other strong religions in the region include Senath, Ingoren and Vorin. Lingering prejudices however, remain for Angadar, Valok and The'ton, while worship of Maleki and Aarilax are often outright banned in public life. Dru'El and Forian are tolerated within most circles, though their worship is subdued and practically non-existant and generally frowned upon. While the terrain of Kurathene is relatively diverse, there are several notable features that are shared within the nation geographically. Grassy plains and flat lands are generally the dominant feature of the land, with a very small number of mountainous regions. Two major rivers dot the landscape, the Methran River to the south which connects southern Kurathene with Brekon and the Nomad River to the north, which formerly was the basis for borders between administrative districts and the singular boon to the Kurathene economy and commerce. The Nomad flows from two principle sources: Lake Hurine to the west and Lake Mantith to the east, meeting near the city of Kuras to form the main length of the river. The western branch is known as the Lower Nomad, while the tributary from Mantith is often called the Gypsy. The Lower Nomad further splits into an artificial tributary known as the Wanderer, which connects through a series of canals to Lake Mantith. The Methran River, named after Lord Methran Arvanos, forms the border between Kurathene and Brekon, a naturally wide river which irrigates an otherwise relatively arid region. The river splits into three various tributaries, the Upper Methran, the Lower Methran and the Orcsbane. The weather is often temperate and mild through nine months of the year, with the winter months being extremely harsh and dry. Spring and summer bring about relatively unpredictable shifts in temperature, but the region lacks any extreme weather patterns. Known for its propensity for strong winds and rainy autumns, the Peninsula is temperate, with relatively unstable weather but predictable temperatures from early spring to late summer. Autumns bring the storm seasons from both the North Sea and Amelede Bay, along with gale force winds. The often changing nature of the weather has made discussions of it a popular pastime in the city of Kalion. Characterized by its warmth and stability, the Basin has perhaps the most pleasant weather of any region in Kurathene. Foul weather, particularly in the form of flash rains and lake effect storms are concentrated in the winter months, giving a good, stable yield on crops during the spring and summer. Harsh and unrelenting, the Frontier can widely be split into two seasons, the comfortable, sunny summer months and the blistering cold winter which if predictable is often defined with heavy snowfall and consistently cold temperatures. Defined by a relatively arid climate, the Steppe is known for its dry summer months and wildly fluctuating temperature during the winter, where it can often go from scorching to freezing in the space of a few hours. With the ocean on one side and the Nomad River on the other, the Champaign is known for its predictable, reliable and pleasant weather, with only narrow changes through-out the year. While somewhat cooler than the Medec Basin, the winter months in the Champaign are somewhat more manageably dry. This page was last edited on 5 October 2018, at 08:19.